Barefoot India Marathon | March 31 2019. There are so many numbers of NGO supporting various causes around the world and in our country. But there was something never looked at or never bothered so much. After taking a proper survey across India Dr. Joyappa Achaiah came to know that still millions of people across our country can’t afford footwear. Any human being tends to walk a lot every single day of his life. There is nothing worse if a person isn’t having the liberty to walk where he wants. India is a country with mixed climates and terrain types some areas with hot sand, some with thorns and bushes and some with gravels and stones etc… people walking barefoot in our country has to face a lot of painful situations like infections, accidentally walking in broken glass, nails or such sharp objects and diseases. After an extensive case study on this topic, Dr. Joyappa Achaiah initiated Barefoot India Campaign in early 2015, leaving his well-paying job in one of the top real estate company in India. To make people understand about the cause he went on a 100-day trip across the country without wearing footwear. This created curiosity in people who looked at him and was intrigued to ask him “what is the reason behind?” That made many people realize and had made many people come forward to support the cause in any way possible. Few Indian footwear companies have approached and supported. Since then 20 million footwear was distributed from the Barefoot India Campaign. This initiative grabbed the attention of some of the most influential people around the world and they have personally appreciated this cause. The UNO, WHO and the World Bank are some among them. This initiative also won several awards and accolades from the PM of India, CM of Karnataka and many others. To let people, know about this “one of a kind” initiative Dr. Joyappa Achaiah is hosting the first Barefoot India Marathon on 31st March 2019, 7:00 AM at Cubbon Park, Bengaluru. Marathons are conducted for various reasons but this marathon is the most related to its own cause. All the funds collected through this marathon are directly going to the people who can’t afford footwear. 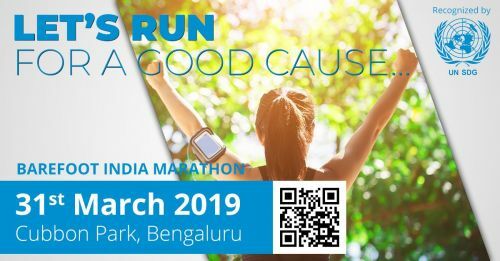 We would like to inform all the sports enthusiast and runners across Bangalore and south India to consider this unique cause and take part it in. The passes to the Barefoot India Marathon are available on Eventshigh.